Onam is ancient and one of the important festival celebrations of Kerala mostly depends on the state's agricultural and climate. Every year Onam starts at the end of the monsoon session, probably a harvest season in Kerala. Onam celebrates the homecoming of Asura King Mahabali from Patal Lok, whose era was considered the golden time of Kerala. Irrespective of religions all the Malayalees get together with all the excitement. In this important celebration, the most significant part is the Onam Sadhya meal feast. This meal contains over 26 different delicious dishes served on banana leaf. In this article, we going to find out the nine delicious Onam Sadhya Recipes. Rice is the main core in the Onam Sadhya. Rice is used to be brown color semi-polished or red rice. Because, The brown rice is not only delicious it also contains more nutrition like fiber, protein, and selenium. Sambar is the most delicious recipe usually served with rice. it made up of vegetables like tomato, carrots, potato, onions, peas and other spices. Sambe gives added nutrition to the Onam Sadhya recipes. Rasam is a tamarind based juice tangy recipe. It contains Chili pepper, cumin, and other flavored herbs gives rich in iron, calcium, copper and magnesium kindy healthy nutrition to the healthiest sadhya fest. The coconut base avial recipe is a solid and delicious one served in different combinations vegetables. Different Avial provides essential minerals and vitamins to the body. This is usually prepared with white gourd and coconut milk, also seasoned with ginger and coconut oil. Olan adds extra taste and healthy vitamins to Onam Sadhya recipes. Kaalan always prepared many days in advance. it is the combination of green banana, turmeric, grated coconut, pepper, jeera, yogurt, and green chillis. Kichadi is a famous recipe in Sadhya fest, it also similar to raita. Kichadi is usually prepared in yogurt base also added with beetroot and cucumber. Thoran is a delicious fusion of vegetables like raw jackfruit , peas, carrots , green beans, or cabbage. This healthiest Thoran provides vital nutrition like fiber, vitamins, and iron. 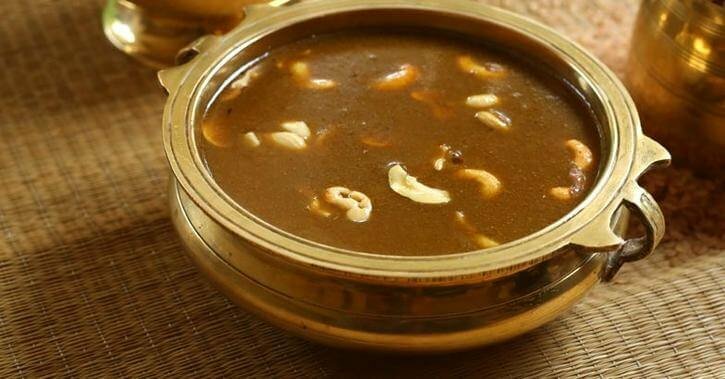 Last but not the least, Sadhya’s traditional dessert ‘payasam’ is a most delicious sweet served at the end of the meal. It has several varieties such as ada prathaman,palpayasam, pal ada payasam, semiya payasam, and ney payasam. Disclaimer: This content including health information provides general information only. It is in no way a substitute for a qualified medical opinion. Always consult a specialist or your own doctor for more information. www.foehub.com does not claim responsibility for this information.